Imagine a gardener is offered honorary citizenship by many countries like USA and European countries to a Gardener for his works. Such is the case of Nek Chand Saini who secretly started using the waste materials into sculptures way back in 1986 to crate rock Garden then out skirts of Chandigarh, India. The first Sculpture garden any where in the world was created in Chandigarh Nek Chand . It is also known as Nek Chand’s Rock Garden after its founder Nek Chand, a government official who started the garden secretly in his spare time in 1957. It was created by recycling the waste from homes and industrial areas.Nearly all who visit this rock garden are inspired by the presentation to do something to save environment by their own efforts. Today it is spread over an area of forty-acres (160,000 m²), it is completely built of industrial & home waste and thrown-away items. A true Eco friendly effort in originality. The Rock Garden construction was discover over 10 years after its commencement. Mr. Nek Chand Saini who was working as a Road site engineer with Chandigarh Administration was asked more than once to demolish the works as the Garden was not as per Chandigarh’s plans. But it was too late by then. The public opinion was in favor of the selfless efforts of the humble genius Nek Chand. The Garden was located on the Government’s land in total violation of prevailing laws. The politicians demanded to destroy the illegal garden and teach a lesson to Nek Chand. At the same times others wanted to ensure that rock garden became well funded public park. Nek chand was to continue as Creator -Director of the Rock Garden. The city administration gave 50 laborers to carry on the second phase of making help install all his sculptures in the mosaic courtyards of the Second Phase. After his award for an original idea creator the Administration withdrew all support baring the entry fee. by 1988 some powerful men could not digest him getting international fame. A lengthy court battle ensued, eventually resulting in victory for a by now exhausted Nek Chand and giving him the security his Rock Garden needed but with little or no funding. From 1988 onward funds dried up, with even the admission money being withheld. In 1990, a road for the exclusive use of VIPs was to be built right through the middle of the Garden. Trees were cleared ready for construction and bulldozers arrived at the very walls of the Rock Garden, only to find their way barred by hundreds of children and demonstrators. 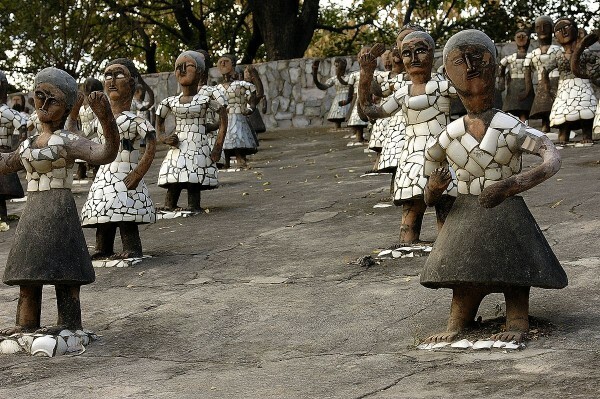 A lengthy court battle ensued, eventually resulting in victory for a by now exhausted Nek Chand and giving him the security his Rock Garden needed but with little or no funding.